Where is the real Leeds? How does one get there? Is it floating on the air–words and music you can almost reach out and grab like wriggling worms of sound and ether? Is it in the carnival that seethes under the corrupted church, drawing the lost along shadowy corridors and through the strangely angled Funhouse doors to the place where the city fathers perform secret rites with the goat-headed masters of the dark? That music, that voice calling on the edge of static and distortion–it might lead you to that blasted and damned path toward the Real and Truest heart of Leeds, Massachusetts. This is WXXT. It’s the witching hour, when shadows take wing and nightmares stalk. Turn your radio up. Point your antennas to the infinite sky. And stay tuned for Weather on the Sixes. WXXT. The bubbling blisters on the tongue of the Pioneer Valley. 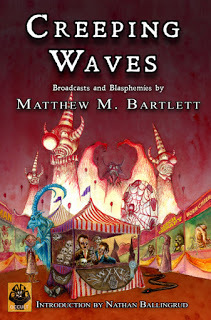 A dedication to setting, mood, and voice, atmosphere seeps through the pages of Matthew M. Bartlett’s Creeping Waves. Taking place in the Pioneer Valley of Western Massachusetts, it’s a credit to Bartlett’s imagination that he can mine such apocalyptic horror out of a region known for its bucolic towns and pastoral tranquility. While the book appears to be a collection of short stories, flash fiction, vignettes, snippets of discarded newspaper articles, and transcripts of Satanic radio broadcasts, everything congeals to build a consistent and interconnected world. Brick by brick, Bartlett mindfully constructs a grotesque, maggot teeming memory-town to which he transposes over the modern-day. It is the rotting past versus a banal present: a battle silently waged in many rustic New England towns that have a foot in two eras. Bartlett’s wicked imagination makes for a deliciously deep dive into this playground. Over and above the individual narratives, I found myself craving the background and history of this degenerate world, its denizens, and its shy, morbid capital of Leeds. In what may be best described as a fragmented novel, there is a consistent premise woven through its chaos. Bartlett doesn’t set a straight-line towards a climactic destination, rather he sends the reader in orbit around a thematic epicenter to view its many facets. In many of F. Scott Fitzgerald’s books, he advanced an concept of despairing corruption of the American Dream. Fitzgerald presents a ballistic theory of everything: business, government, family, and culture following a bell curve of an idealistic rise leading to an apex of disillusionment preceding a cynical fall. What goes up must come down. Matthew Bartlett inverts Fitzgerald’s curve as he presents his own ballistic theory of stagnation. Creeping Waves is an ode to rot. Most small New England towns have informal aristocracies, whether they be its founders, benefactors, or legends of the past. However, the gifted and ambitious progeny of these clans are most often lured away to the city or more exotic locales, their dreams too big for a small town. The less enterprising and less altruistic are those that stay, clinging to legacies and inheritances. They are hostile to strangers. They fight change. They institutionally entrench with a septic bitterness. Even in death, they are loathe to give up what has been bestowed unto them. So is Creeping Waves a cautionary tale of a community in full spoil, systems failing miserably from neglect and indifference. Bartlett’s protagonists: the Dithers, Shinefaces, and Goldens scrabble and cling to their stagnant kingdoms. So too, the anarchic business enterprises of Radio WXXT and Annelid Industries International radiate a mad nihilism as a consequence of being unchecked and uncurbed for so long. Reality erodes in Leeds, even time becoming a casualty. The sole winners are the leeches and maggots. In Leeds, only the conqueror worms win. And this is why Creeping Waves matters. We know what happens when that unexplained puddle in the basement goes ignored and untreated. The musty smell may be masked, but in time, a mold blooms. We know what happens when institutions go unregulated. Markets fail, lakes are polluted, and people get sick. Psychologists know what happens when phobias or post-traumatic stresses are repressed. Only when our deepest anxieties are confronted can paralyzing neuroses and violent psychoses be avoided. This is the ballistic theory of stagnation. This is the real Leeds. Creeping Waves gets my enthusiastic recommendation. For readers who value atmosphere (especially the dark and sinister), this is essential reading as Bartlett constructs a fascinating, fully fleshed literary world. It is also a highly interpretable work. In the same spirit as Carl Jung’s Red Book, it provides an unexpurgated exploration of the unconscious and the shadow. This is an artist dedicated to a vision, not a promulgation of ideology or moral fable. Creeping Waves is a work that exists in the phantasmagoric borderlands of the irrational and weird. So please consider a visit to Leeds. Come in the fall when the Berkshire foliage is in peak. Just drive, it doesn’t matter the roads or the direction. Turn on the radio, sling the dial all the way to the left, and sing along to the apocalyptic polka (you and your family will know all the words). When you see the trees stripped of their leaves the fat trunks reaching up into a blood sunset, you’re close! Step on the gas and take your hands off the wheel. Almost there! And when the car veers into the woods on its own accord, and the trees whizzing past become so straight to be tent poles, and the radio gets dangerously loud, and the black canvases billow in the gale blotting out the moon: rejoice! Welcome to the real Leeds. Creeping Waves is available on Amazon here in Kindle, Paperback, and Audiobook editions.